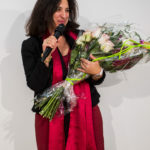 Celebrating a decade of advocacy in regional space uses! 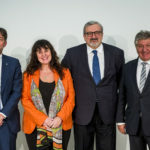 Senior political and technical representatives from NEREUS member regions, together with the President of the Italian Space Agency, Mr. Roberto Battiston, and CNES Chief Operating Officer, Mr. Lionel Suchet, reconfirmed their political commitment to NEREUS’ mission on the occasion of the 10th anniversary of the network (Brussels, 29th November 2017). As a concrete sign of their political commitment, partner regions signed a Joint Declaration on Key Political Priorities for 2018-2020. 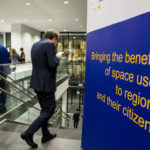 At a time when European space infrastructures have grown increasingly mature, the massive availability of space data needs to be transformed into more space solutions serving citizens. In this respect, regional authorities cover a crucial role, acting both as procurers and key users: they impact on both sides of the value chain, driving the offer as well as the demand for space solutions. 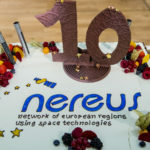 Citizens from NEREUS member regions demonstrated the importance of space in their daily lives and work: from a nine year-old child who lived as an Astronaut for one week at the Euro Space Center, to civil servants using space to tackle toxic algae or forest fires, passing from an entrepreneur with over 20 years of experience in integrated space applications. 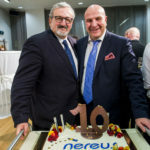 As host of the event, Mr. Mark Weinmeister (Secretary of State to the European Union of the State of Hesse) underlined in his welcome speech the significance of NEREUS for the State of Hesse, which strengthens the European dimension of regional projects. NEREUS-President Mr Michele Emiliano introduced the festive ceremony by recalling the three core pillars of NEREUS’ activities. Space technologies enable local and regional authorities to improve their territorial management activities. This contributes, in critical times for Europe, to strengthen the trust in the EU project as a whole. 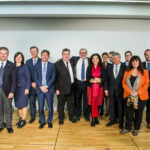 Furthermore, despite the recognition of regions as a crucial player in the EU space strategy, its implementation does not always adequately take this into account. 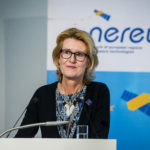 Inspirational keynote speeches by high-level representatives of EU institutions followed: MEP Constanze Krehl (Rapporteur for the EU Space Strategy) highlighted the spill-over effects of EU space programs, Copernicus and Galileo, in terms of employment, research and innovation: “We must continue to see the space industry not as a cost for EU citizens, but as an investment in our future”. Andrees Jaadla (Committee of the Regions, Rapporteur on the Opinion on the EU Space Strategy) reported on the commitment of the CoR in strengthening the regional dimension of the EU Space Strategy, bringing concrete examples from his home country Estonia how local economies can thrive when investing in digitization, space and new technologies in general. 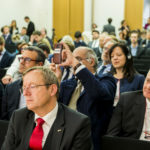 Finally, the Director General of the European Space Agency, Prof. Johann-Dietrich Woerner, gave a visionary speech which led the audience from the achievements of space exploration to the potential of space applications. Triggering a fascinating journey tinged with sense of humor, he recognized that the global impact of space should be counterbalanced by the regional level, as regions can apply specific ingredients to use space data and imagery to foster local economies. 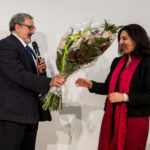 Over 150 participants attended the festive ceremony, reinforcing the strategic partnerships of the network with relevant EU institutions and other stakeholder associations.